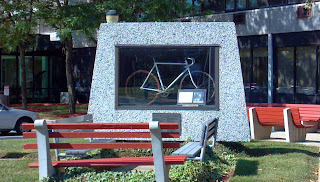 We've found some interesting roadside historical markers, but this was a new one: a bicycle behind glass. It's the centerpiece of a pocket park on West End Avenue in downtown Somerville. From a distance, it looks like a display case containing a modern racing bike, and you'd be excused for assuming it's a promotional exhibit for an enterprising cycle shop. When you get closer, though, you see that it's seen better days. We'd found the wheels belonging to Furman Frederick Kugler, the first winner of the nation's oldest cycling race, the Tour of Somerville. 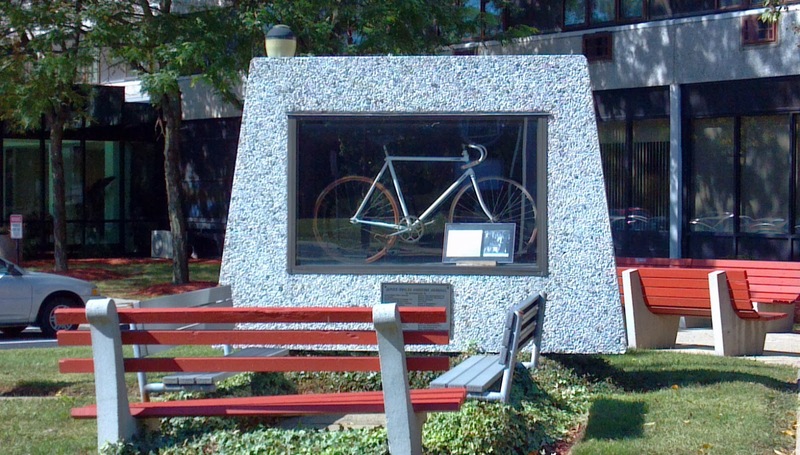 Held every Memorial Day in downtown Somerville, the 50 mile event is among the most prestigious of such contests and draws professional and amateur cyclists from around the world. Some even call it the Kentucky Derby of cycling. According to legend, Kugler wasn't just the first winner of the Tour, he was the inspiration for its creation. His father Fred, also an accomplished cyclist, owned the bicycle shop in town and coached both Furman and his sister Mildred to prominence on the junior racing circuit. When Furman expressed weariness at the travel required to reach far-flung races, "Pop" Kugler decided to start a race in their hometown of Somerville. He mapped out a 1.2 mile oval track using portions of West Main Street, Mountain Ave, West High Street and Grove Street. Local merchants supported the cause with donations of prizes for the winners, which surprisingly caused an issue for Pop's proposed track. West Main Street runs along a portion of State Route 28, and New Jersey road regulations forbid racing on highways. By calling the event a "tour," as suggested by a sympathetic Department of Transportation official, Pop could move forward with his plans while still staying within the boundaries of the law. Furman had already won the Junior and National Junior Championships when the first Tour of Somerville was held on Memorial Day 1940. Victorious in the initial running, he returned the following year to set a national record of 2 hours, 5 minutes, 7 seconds in capturing the 1941 trophy. Unfortunately, those would be the only local victories for the hometown hero. With America's entry into World War II, Furman joined the Navy and was killed in an accident onboard the USS Wichita off the Ryukyu Islands, Japan. His friend and 1942 Tour winner Carl Anderson also died in service during the war, prompting organizers to rename the race the "Kugler-Anderson Memorial" in their honor. More than 70 years after its first running, the Tour of Somerville continues to draw cycling talent from around the world, cheered on by thousands of spectators who line the race route. Much like the Indianapolis 500 is for its hometown, the Tour is a Memorial Day staple that all of Somerville looks forward to. It's become an event for cycling fans and non-fans alike, with additional road races and plenty of activities for the whole family.